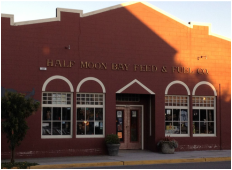 Main Street – many tiny independent shops. 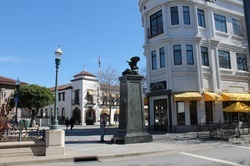 ​Pacific Avenue, Santa Cruz – The downtown shopping strip in Santa Cruz offers tiny independent shops and boutiques, but also chains such as Urban Outfitters, American Apparel, Gap, and Forever 21. 41st Avenue, Santa Cruz/Capitola – Along 41st Ave you have several surf, skate and tiny esoteric and nicknack shops. 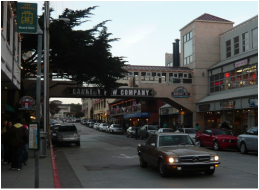 Cannery Row – At Cannery Row you have small souvenir shops, restaurants, bars and coffee shops. Alvarado Street and side alleys – Within the downtown area you are spoilt with choice. Here you have several boutiques, chain stores, bars, coffee shops, and restaurants. 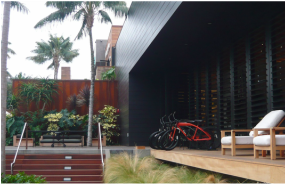 ​Ocean Avenue & side alleys – Along the quaint streets and squares you have many boutiques, galleries, restaurants, and coffee shops/bars. Carmel Plaza – The open air shopping mall features high-end designer stores but also popular chain stores such as Anthropologie, J. Crew, Bottega Venetta, L’Occitane, Louis Vitton, Tiffany’s… and a real good cheese store: The Cheese Shop. Carmel Rancho Shopping Center – Within the mall you have a large supermarket (Safeway), drugstore (CVS), and bank (Bank of America), plus several smaller shops. 40 Outlets stores incl. CK, Ralph Lauren, Nike, Tommy Hilfiger etc. 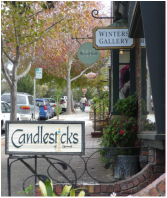 ​State Street – Shopping mile in downtown Santa Barbara with many tiny independent shops and well-known affordable and expensive chains. 160-outlet shops incl. Lacoste, UGG, DKNY, Fossil, Ralph Lauren, Nike, and Tommy Hilfiger etc. An outdoor mall with plenty of shops, e.g. Mac, 7 for all Mankind, Anouk, Ralph Lauren…and courtyards offering benches to relax or having a snack. The contemporary outdoor mall is located next to the Country Mart and contains stores such as Intermix and Kitson. Moreover it offers lounge where you can rest during your shopping spree. The design and amenities give you more the feeling of a resort than a mall. Huge shopping mall with all common department stores and chains, such as Bloomingdales, Nordstrom, Kitson, Kenneth Cole, Coach, Burberry. 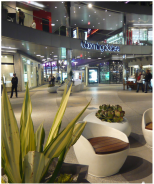 Third Street Promenade – Shopping mile between Santa Monica Place Shopping Center and Wilshire Blvd. with shops like Abercrombie & Fitch, Banana Republic, J. Crew, Sephora, Kitson, … closed for traffic. Abbott Kinney Boulevard, Venice – The boulevard is the shopping center in Venice and packed with independent stores, charming restaurants, and bars. Between Venice Bvld and Main Street. Waterside at Marina del Rey – 4700 Admirality Way. Outdoor shopping along Marina del Rey harbor. Melrose Avenue, between La Brea Ave and Doherty Drive. Melrose Ave is the shopping area for trendsetters and offers stores, such as MiuMiu, Agent Provokateur etc. But also less hip designers, such as Ed Hardy and Von Dutch. Without doubts the most luxurious shopping mile in L.A. featuring Versace’s, Chanel’s, Tiffany’s etc. flagship stores. Even if you cannot afford it, don’t miss to do some window-shopping, watching people. 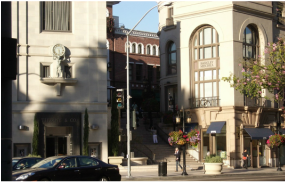 At the end at Via Rodeo is a shopping arcade and at Rodeo Drive a small outdoor mall. The giant outlet mall is located at Interstate 5 northeast of LAX. You cannot miss it since it’s huge complex is yellowish (I guess sandstone) and looks like an Egyptian fort. Here you can be sure to find all common American and European designers and brands. Mon – Sun 10am – 5pm. Actually the district only opens for wholesales but there are about 1000 shops that are offering great bargains to walk-in customers as well. Marine Ave, Balboa Island – Small shopping street with tiny shops and boutiques, nothing for a shopping spree but nice to stroll along. Coast HWY – The part of HWY 1 that runs through Laguna Beach’s city center and its side alleys are packed with shops. Walk down Ocean, Park, Forest, and Laguna Ave.
90 Outlet shops with brands like Adidas, Lacoste, Banana Republic, Ralph Lauren.